Great article, it suits perfectly with my current situation, it seems as if you just had review my trading week xd. I’m just starting my journey, in fact, this just was my third week trading your YTC PAT strategy in a simulated environment. 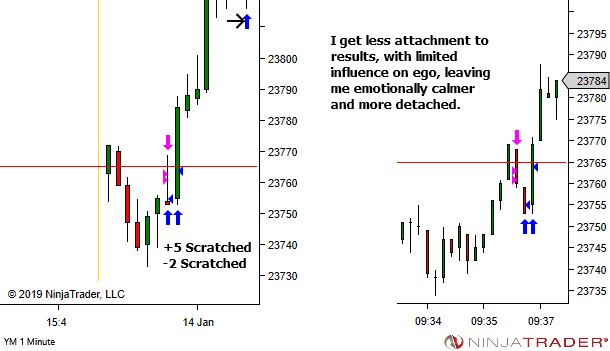 In my first serie of twenty trades (it took me two weeks), albeit the final result was negative (of course, just was the very first serie), my mindset was very good. No fear, no doubts, no nervs. I just followed the market as it unfolded and if I thought a good opportunity was present I just entered the market, with no doubts. If profitable, good and move on the next one. If lost, after a second of “dammit”, also good and move on the next one. 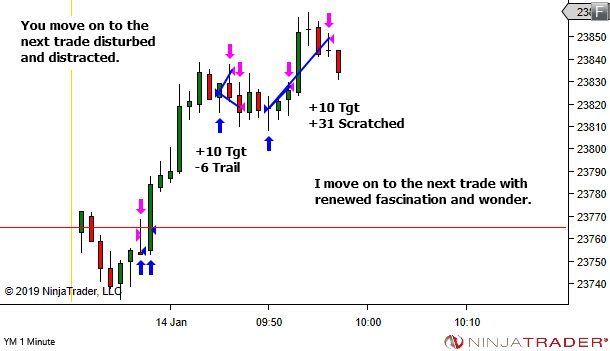 But, after reviewing that first serie and see these amounts of errors, such like fading strength or enter ahead of the right time, this week I was trading with a permanent feeling of doubt and fear to make wrong trades. 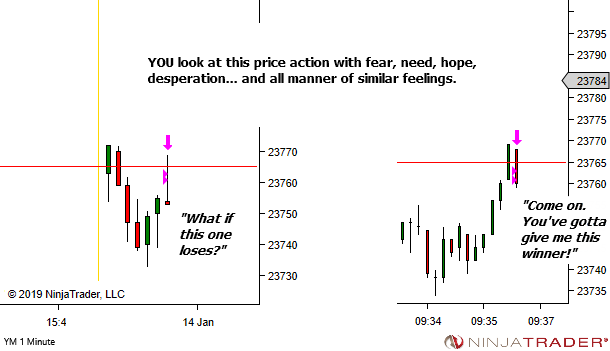 When a setup is present, my thoughts vary between the fear of miss the trade and the fear of being wrong once again. And when I’m inside the market, I use to be pretty nervous. The results of this week are being a bit better, but I’m not feeling comfortable at all. I know the theory, I know losses and errors are part of the game, I know this is an environment of probabilities (I’ve read Trading in the Zone a lot of times), etc. 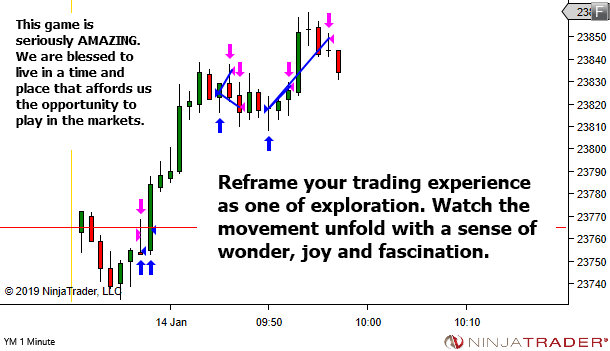 But in the moment of truth, I keep giving to much importance to every individual trade. How could I work to achieve that mindset of “just watching and executing”, but without make a lot of mistakes? I feel I need to work in order to really internalize that this game is a game of odds. But I’m not sure how to do it. The stats for the first group simply set your initial benchmark. Then follow the process outlined in the articles and actively drive your growth and development. Email me for any further guidance if you get stuck (rather than contining this as comments on a blog post). (b) Q. How could I work to achieve that mindset of “just watching and executing”, but without make a lot of mistakes? Experience. There is no short cut. (c) Q. I feel I need to work in order to really internalize that this game is a game of odds. But I’m not sure how to do it. Again, experience will help here. But there are exercises you can do to help. Lets start with this for an example. Get a coin. A single toss of the coin will represent one single trade – heads being a WIN and tails being a LOSS. Obviously there is a 50% win ratio (over time). But let’s create a small edge by valuing losing trades as -1. And winning trades a +1.25. Now… make 20 trades (20 tosses of the coin). After each one, write down the result. And update the cumulative P&L. When you’ve completed 20 trades, calculate the stats for the group. Win% and total P&L. Repeat for at least 10 groups of 20. What you’re aiming to do here is to experience the variation in results. Seeing not only losing trades, but sometimes also losing groups. But overall, results will more often than not be on the positive side. This will have edge over a large enough sample. 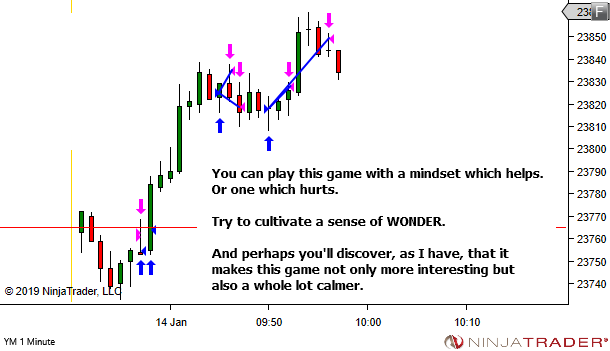 Play it over and over until you get completely comfortable with the idea that a positive edge… DOES HAVE LOSING TRADES… and they don’t matter at all. You just need to keep playing and let the edge play out over a sufficiently large sample. Now of course, trading is a little different. 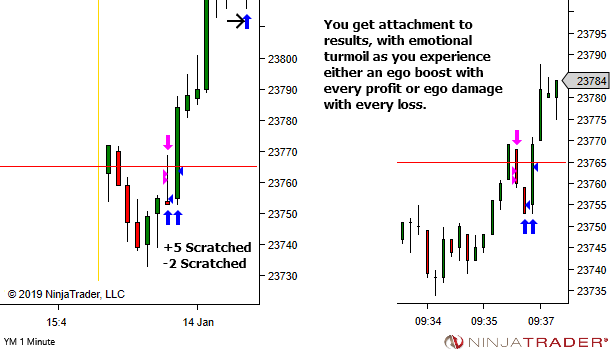 Unless you operate with a completely passive (set and forget) management style, your losses and wins won’t be fixed amounts. But once you develop edge, the outcome is the same. Any grouping of 20 will contain sequences of wins AND losses. Just like the game with the coin. It’s completely normal. Losses are just a cost of doing business. 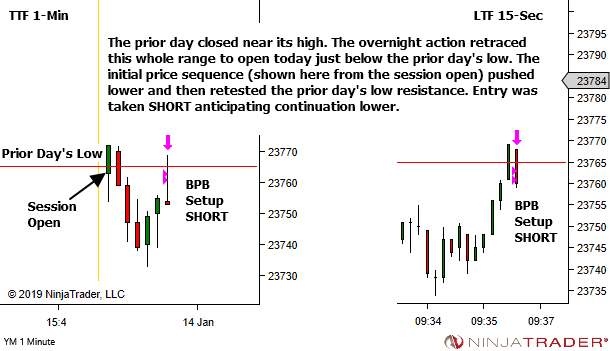 For the LTF, are you still using 1-range chart or is better the 15-seconds? I find having two perspectives helps, in that sometimes information is visible in one that is hidden in the other. If you find that overly complex though, just pick one and be consistent in its use. 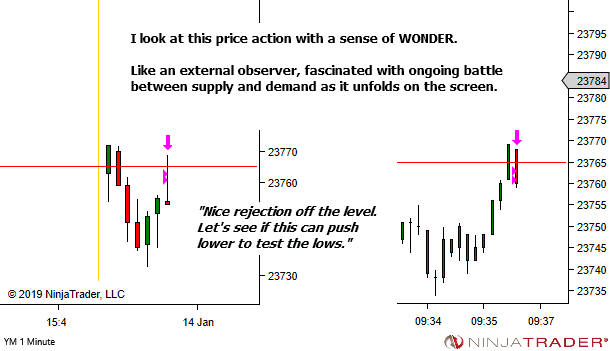 I’m reading the YTC Scalper so I’m very interested in any update. Will send you an email.